This exuberant picture book by Katherine Hannigan, the acclaimed and bestselling author of Ida B, is about math concepts, friendship, and imaginative play, and is told entirely in equations! A young girl and her dog spend the day playing in her backyard, where with her imagination—and a few helpful props—anything can happen. What do you get when you combine dirt and water? Mud! What do you get when you take a sheet, a flowerpot, and a stick and make a costume? You transform yourself into Her Majesty, the queen! A cape and a strong breeze turn the treehouse into an airplane. A sheet, a stick, and a pair of well-placed cat’s ears turn the girl into a pirate! At least until mutiny leaves her alone in her kiddie pool . . . surrounded by sharks! 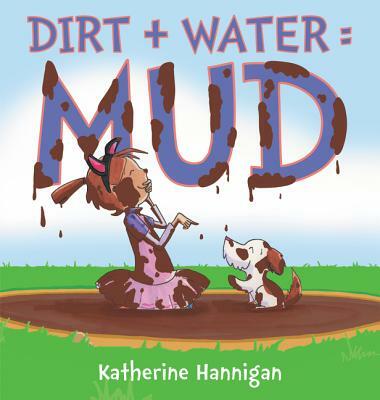 Cheerful and action-packed illustrations and a combination of comic-like panels, conversation bubbles, sound effects, and full-page illustrations make Dirt + Water = Mud particularly appealing for new readers. Katherine Hannigan studied mathematics, painting, and studio art and has worked as the education coordinator for a Head Start program and, most recently, as an assistant professor of art and design. She is the author of True (. . . Sort Of), Emmaline and the Bunny, and the national bestseller Ida B . . . and Her Plans to Maximize Fun, Avoid Disaster, and (Possibly) Save the World. She lives in Iowa with a bunch of cats and the occasional bunny or bird visitor. Her backyard hosts an additional array of creatures, including deer, raccoons, possums, and sometimes a skunk. But no alligators . . . yet!